The success of urban development in Singapore had been largely attributed to the island’s geographical centrality on the Europe-Asia shipping route during the colonial period and later the nation’s ability to successfully attract overseas enterprises to set up shop after independence. Yet at the heart of economic success lies the essential support of an ever-growing migrant population that continuously support and sustain the rapid urban growth. Much overlooked, sanitation is at the heart of ensuring the well-being of the working population in the city. It remains essential to control the spread of diseases which has a direct effect on mortality and morbidity. Diseases have the potential to not only debilitate the local population, but also cripple the city’s economy. Early 20th century British administrators perceived the surveillance and reorganisation of the environment by using “scientific” health principles as the only way to eradicate diseases and improve the populace’s well-being. 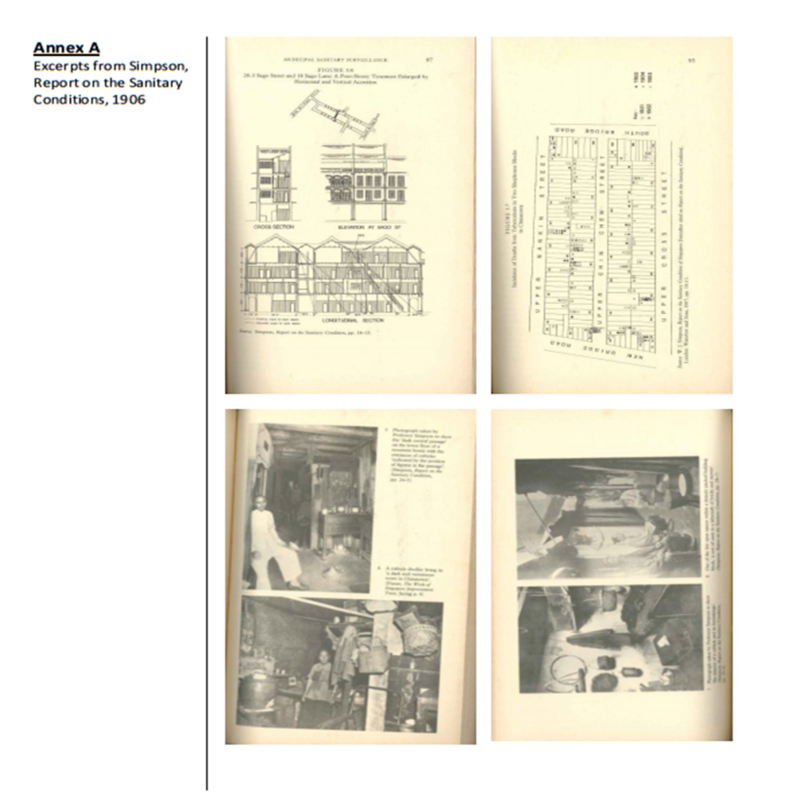 The 1906 Sanitation Report undertaken by Prof WJ Simpson was the first large-scale report in Singapore that drew a link between poor sanitation and overcrowded housing conditions. He identified the prevalence of tubercular diseases amongst working population living in overcrowded shophouses and its tendency to reach epidemic levels. The report had far fetching consequences on the implementation of sewage disposal, medical care and water supply in the city. More importantly, it regarded urban slum as a disease to remedy. The treatment of the malaise was to reorganise the built environment to create open spaces and secondary quarters away from the densely populated urban core. Much of its effects are still discernable, through secondary settlements and backlane systems. More than a century on, the city state remains in an endless loop of demolition, development and redevelopment. Much like the report’s working population in 1906; the driving force of development continues to be migrant workers from countries such as China, India, Bangladesh, Myanmar. 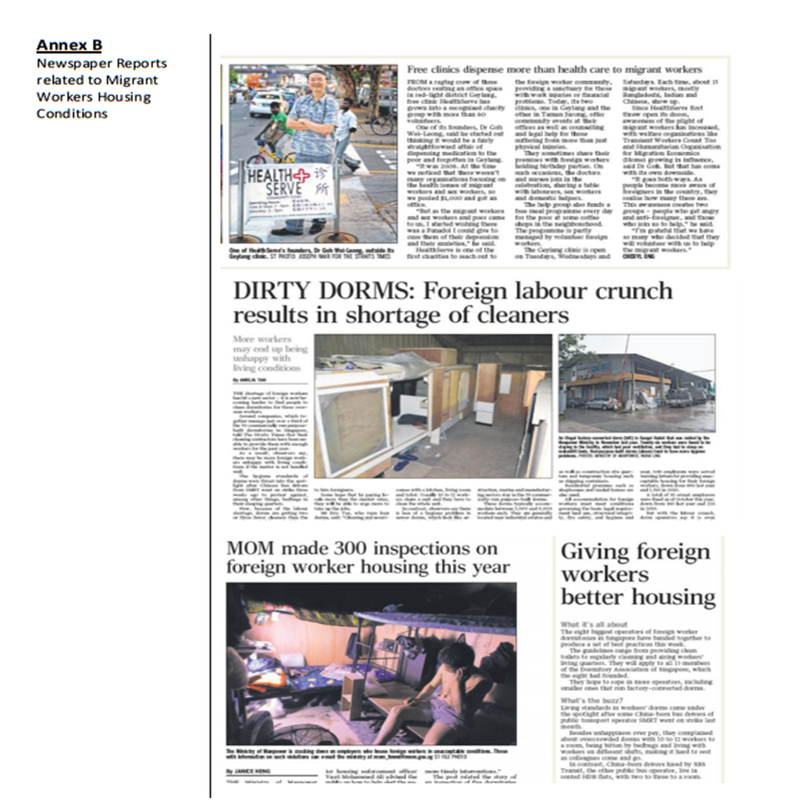 While a majority of the workers are well-taken of by employers, a significant minority are found living in overcrowded dorms in found in secondary settlement areas such as Geylang, Balestier, and Serangoon. While the surrounding environments had been sanitised to fit the consumer needs of an affluent resident population, squalid conditions remain behind closed doors. Overcrowding, poor ventilation and poor waste management plagued the transient occupants of such illegal dormitories in ethnic quarters and old neighbourhoods. Taking reference from the Simpson’s Report, this art project will attempt to draw relationship between health problems plaguing migrant workers living in secondary settlements and how micro and macro environments play a role in affecting physical and mental well-being. However, it neither attempts to form an arbitrary statement on the effects of environment vis-a-vis health condition, nor does the project wish to provide an elixir to remedy issues affecting this specific population. Instead, the project represents the observations, reflections and illustration of the issue in artistic forms. It is the amalgamation of practitioners from two science disciplines- architecture and healthcare, using adept art forms- bookbinding and urban sketching in the course of understanding and showcasing a facet of the burgeoning migrant workforce driving Singapore’s relentless developments. This art project will adopt various strategies from established cultural mapping studies. This involves an interdisciplinary approach in designing every stage of the project as each stage will require logistical, creative and educational inputs. The core of the project team will be made up of the two collaborators with inputs from the curatorial consultants, science professionals and community leaders. The make-up of the project team may differ from each work-in-progress presentation depending on the required expertise to move the project forward. To synthesise findings from both architectural and public healthcare disciplines to better understand issues related to the sanitation and living condition of migrant workers in old neighbourhoods and secondary settlements. To present issues through various visual, auditory and even tactile means that will attract a wider base of viewership to raise awareness amongst resident population. To create second-life for the artistic output such that they will be useful to stakeholders such as NGOs, medical and building professionals and shop owners who come in direct contact with migrant workers. The degree of involvement from stakeholders and migrant workers may vary depending on the sense of ownership from the various stakeholders listed above. The art project aims to actively involve members of the community through the research, surveying and synthesis process of the project. Ultimately, the project hopes to imbue in stakeholders an understanding and ownership towards the project. This will contribute to the continuity of the research and the dissemination of the artistic output (e.g. useful information, brochures) to the migrant workers. Note: This proposal was not selected for Substation’s Open Call 2014. It remains as an open work which the collaborators may revisit some point in the future.